This wasn't home. Nothing ever would be again. And besides, I didn't want a home - the word came with memories too painful to think about. I know this book received mixed reviews, but I really enjoyed it. To be honest, I've never come across an Abbi Glines book that I didn't like. This has all the ingredients that makes Abbi Gline's books so popular. OK, West is a bit of douche bag, in fact, he is a lot of a douche bag, but it isn't like these characters don't exist in real life. And girls are often attracted to them. West is hot headed and uses to girl's to make him feel better. He knows it's wrong, but he is dealing with so much emotional stress from home, he doesn't care. Maggie makes West better. I loved Maggie! Maggie may be silent, but she is strong and pulls him through a difficult time in his life, making him realise what a jerk he has been. She has seen so much worse than he ever will and is still standing tall. Her strength of character is phenomenal. I loved the setting of this book. The high school football ground has a homely feel to it. 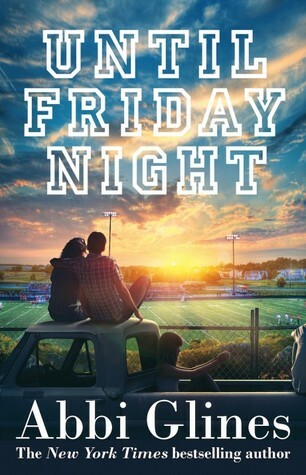 Everyone keeps saying how it reminds them of Friday Night Lights, which I've never seen, but will be watching on Netflix very soon. I think it's brilliant how Abbi sets up the next book, by introducing the characters into the previous story. Willa and Brady both featured in this book and their story is featured in Under The Lights. If you love classic Abbi Glines, with bad boys being tamed by girls, then you will love this one too. This is the first book in the series and I can't wait to head into the next one, Under the Lights.